Jonas and his team are excellent to deal with. Our purchasing process was lengthy as we spent almost 2 years from starting our search across most NZ dealers, through to receiving our van. Jonas was very responsive and patient with all our visits and questions; we never felt under pressure. We were even advised of the vessel that transported our van from Germany, so we tracked it around the globe on its journey to us. Jonas fitted extras including a personalised plate with no issues. Follow up service has been straight forward and the team resolve our queries, and tend to go the extra mile. The new Pokeno facility is very professional, I just wish they could service the Fiat there as well! The van drives well, and the layout works really well for us, with lots of storage. So keep up the good work Jonas, and we wish you continued success as you grow your business. We bought a Dethleffs motorhome (7887-2) from you almost a year ago and are very happy with it. We have toured the North Island and part of the South Island and haven't had any major problems yet. The motorhome is very comfortable and spacious - ideal for our family of 5 plus dogs. Thank you also for the quick and uncomplicated customer service, when little repairs needed to be done. We feel in very good hands with you. Having owned 2 Caravans and 3 Motorhomes since 2001 we like to think we have a fairly good understanding of our requirements. We upgraded to our first A Class vehicle in September 2017 when we purchased our Dethleffs Globebus i007 Motorhome. Although slightly smaller than our previous Motorhomes, the A Class configuration, large garage and excellent overall design suits us and based on the number of people who have admired it we are not alone. Feedback suggests people like the fact such a complete package still only requires a WOF. We have enjoyed many trips away our longest being from January to May 2018 when we spent most of the time in the South Island. Our ‘new’ Motorhome has now done nearly 10,000 kms which is certainly above average for 1 years use and we are very happy with our purchase. Sure there have been a few small items which required attention but that’s no different to the other new RV’s we have owned. There are two key points of difference with Zion. Firstly the product range reflects what is arguably the widest choice of quality Motorhomes available from any RV dealership in N.Z. Secondly its the people factor. We always look forward to meeting Jonas, Diane,Chris and Mark. They are invariably polite, welcoming and importantly listen to the points you make and then proceed to deal with any issues. The new building at Pokeno should provide for their needs for some time and we wish Jonas and the team all the best going forward. Chris & I have owned motorhomes since 2009. We sold our previous motorhome in 2013. Each year for the next 4 years we went to the Covi Motorhome Show and looked at the various makes and models available. We knew what we wanted in a motorhome and each year we concluded that the Dethleffs Globetrotter XLi was the only one that ticked all the boxes. Jonas was very patient with us and eventually in 2017 we were in a position to purchase again. We ordered a Globetrotter XLi from the factory through Jonas who was extremely helpful through the whole process. To date our motorhome has lived up to all expectations. If you are considering purchasing a motorhome we recommend that you contact Jonas and his team. You will not be disappointed with either their product or service. All I can say is that I would never buy a Motorhome from anyone else. The service we recieved exceeded our expectations. We could contact Jonas at any time if we had any questions about how to operate certain things on the Motorhome. His prompt reply ensured a stress free time getting familiarised on how things worked. If you are looking to purchase a Motorhome then you should see Jonas and his team first. Back in June 2017 I approached your company wishing to gain information as I was considering the procurement of a Motor Home. The service you provided me was exceptional, you provided me with the options available and informed me to consider these options and call you when I was ready. Finally in December we settled on the Globetrotter whilst second hand, the attention to detail & service remained the same. I wish to inform you we are very happy with our purchase and having dealt with other suppliers during the process find your customer approach beyond reproach. We took delivery of our Dethleffs Magic Edition in January. The service we received from Jonas and his team was exemplary. Very professional and prompt. We love our motorhome, no issues at all, very quiet unlike a competitors brand that we briefly owned. The build quality is superb, everything works perfectly. We have only driven 1.200 kms so far with 2 trips to the coromandel from our home in Mt Maunganui. Next week we leave for Wellington via Hawke’s Bay then New Plymouth for Womad. We recommend the Dethleffs brand without hesitation and the service from Jonas and his team. Please feel free to call me at anytime. Sarah and I have been Motorhome owners for the last 16 years and with the sale of our business it was time for an upgrade to something more modern and with a few more horses in the engine bay. Having already owned a Motorhome meant that we had some fairly fixed ideas about what we wanted in the new one and what we didn’t. It quickly became apparent that the Dethleffs range of Motorhomes ticked the most boxes on the list. We visited the sales yard in East Tamaki and met Martin who was extremely helpful and spent close to a couple of hours with us patiently answering our questions as we moved from model to model viewing the range, but no decision was to be made until we had visited the Hamilton motorshow. So in September we caught up again with the team and met Jonas for the first time as we closely inspected the full range of competitors products on display. By Saturday afternoon and two days of walking round the show we had narrowed it down to the Dethleffs and 2 other models and decided that we would sleep on it. Sunday morning and after much discussion we had decided on the Dethleffs it was just a matter of the Esprit or the Xli so we arranged to visit Jonas during the week and make the decision. In the end it was no contest the Xli just has that much more kitchen, lounge space and storage than the Esprit and we made the decision to buy. The team from Zion, Jonas, Chris, Martin, Diane and the rest made us feel welcome every time we visited and it has a real family feel, this also helped in the decision. “We had been owners of a nine metre coach-bus recent conversion motorhome but were tiring from both the worry at COF’s in an aging vehicle and only one of us had a HT drivers licence to drive. Being experienced NZMCA members we were not confused with the differences that different set up systems offer. We had decided on what we were prepared to spend and did a lot of research into various types of new Motorhomes available and ultimately decided on the Dethleff 7057 EB Trend which has exceeded our family’s expectations for its great functionality and comfort, resulting in holidaying with ease and enjoyment. Initially we were concerned about downsizing from a larger vehicle to a smaller motorhome but have been impressed that our Dethleff Trend is far more efficient with storage and in fact fits more. We initially were intending to buy new from Jonas, but another opportunity to buy a near new vehicle arose. Jonas and his team were accepting and supportive of our decision. Jonas always answers and responds to calls and emails and assists with guidance and help. Whether you buy a new or used Dethleff vehicle, Jonas has honoured the Dethleff vehicle warranty. We have no hesitation to recommend Jonas and his team at Zion Motorhomes for a great product and great service and follow up”. I can't recommend Zion Motorhomes more highly. Jonas was so quick to answer all my questions, and I had a lot of them, yet he patiently answered all of my concerns. In fact, he often went out of his way to help me. The after sales service has been wonderful, as Chris who takes care of service has been equally helpful. My whole experience has been so much better than I what I was expecting, as I was rather nervous about purchasing a van on my own, after my husband had recently died. But I am so happy to be able to go on the road again with my well designed, full of style, Dethleff T7057 EB Thank you both Jonas and Chris at Zion Motorhomes, I wish nothing but the best for you. After 18 months, 20,000km and around 4 months of “live in” time since purchasing our new motorhome from Jonas it’s time we wrote him a testimonial. Over many years we had rented motorhomes in New Zealand and Europe and also owned small cruising boats, and always intended to have our own motorhome “one day”. As retirement grew closer we spent a great deal of time searching for the perfect model with a very long checklist of “essential” features. Dethleffs and Zion Motorhomes were discovered almost by accident while on a trip to Auckland. Jonas showed me around his current stock and I was impressed by both Jonas and the Dethleff’s range, with its’ clever design and excellent décor and finish. The features “boxes were ticked” and after a flying visit with my wife and more time with Jonas the following weekend we purchased our Magic Edition. On delivery Jonas picked us up from the airport, and with Chris and Diane, gave us a good explanation of how things worked. As always with such complicated things there were follow up “how do we …” phone calls, and we have always and immediately had the advice we needed. Since then (in between periods working) we have travelled the length and breadth of NZ stopping and enjoying many of our favourite places, making the van our home, and meeting many interesting people. The van has always proved reliable, great to drive, comfortable to live in (queen island bed, large fridge freezer, decent sized shower, plenty of storage, excellent insulation, auto central heating). We’ve had some minor mishaps with lightweight pieces of kit but these were few and rapidly and expertly repaired by Vantage RV and UCC Motorhomes in Christchurch. So thank you to Jonas and Dethleff’s for your great service and a great product. After taking delivery of our Advantage motorhome in January we have had trips to Bay of Islands; Coromandel; Waikato; and Taranaki in the first 3 months. All has gone well and the layout and size of the Advantage suits our needs very well. We had never been in a motorhome before and we have learnt how to use most of the technology and equipment but we will become more experienced with further trips. Whenever we have had any queries we have appreciated the service you, Chris, and Dianne have provided with your prompt replies and advice. An example was making up the single bed: We read the manual and when we phoned Chris, his response with photographs of the layout was excellent making it so much easier for us to follow. It’s good to know that you and your team are just a phone call away when needed. Our 8 week trip went well. Looks like the 3 litre Fiat engine is now run in and running sweet. So, 11.68 litres per 100 km, or, 8.55 km per litre. I thought my first figures were very impressive, and consumption was way less that what we had been tracking since owning the motorhome. This was with full water tank, half a tank of diesel, and driver, but no passenger, plus all the gear that we carried with us for the South Island road trip. We have recently purchased a Dethleffs Trend T6757 motorhome from Zion Motorhomes and we are very pleased that we did. It has surpassed our expectation. Jonas from Zion made the buying process as stress free as he could. He would take our calls at any time to answer any questions we had and he gave us as much time as we needed to become accustomed to the new motorhome. We would recommend Zion Motorhomes to anyone wishing to buy a top quality product and have first class service. The motorhome is great! Easy and comfortable to drive, such a pleasure to go away for a couple of days. Will take the motorhome across to the South Island for a couple of weeks later in the year. Having recently purchased a Dethleffs Esprit motorhome from you we want to say how much we have appreciated the professionalism with which you dealt with us over a protracted period of time. Making the decision as to which motorhome best suited our needs (and budget) was not easy. It took several years (and purchase of a competitor's product) for us to finally settle on one that is close to perfect for us. During this time you and your team answered query after query with unfailing patience, always responding promptly to emails and phone calls. This level of service has continued to date. Given this, it is no surprise that we now relate to the Dethleffs slogan 'friends of the family' and view you all as life long friends. We have no hesitation whatsoever in recommending that anyone wanting to purchase a motorhome, consider a Dethleffs, both for the quality of the product and the service delivered. Great holiday in our new Trend bought from Jonas. Drives very well and we love the layout. Large fridge two tv's with satellite dish that goes up easily. Also recommend the internet with Netspeed. Our layout provides large storage and a kingsize bed which is really comfortable. The table layout enables five to share dinner. We are having a wonderful two months in our van enjoying our retirement. Thanks Jonas. 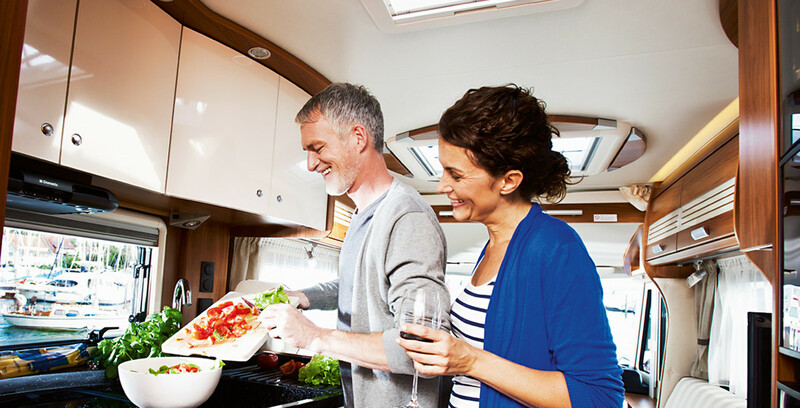 After hiring a motorhome in 2015 we were sold on owning our own. After a lot of research into the various types, new and used, we decided a new European motorhome would best suit our needs. After more research we arrived at the Covi motorhome show in Auckland in March 2016 having narrowed down the contenders to three. We were glad we had researched the options beforehand as the offerings at the show would have been overwhelming! After considering the options we soon concluded that the Trend was for us. Jonas, supported by Chris, helped us through the whole decision making process by providing very helpful advice and suggestions in a very professional manner. The next stage was delivery in June 2016. As with the purchase, Jonas and Chris went out of their way to ensure, over a two day handover, that we were fully conversant with the vehicle and happy with it. We have now been on the road since November 2016 and the Trend is exceeding our expectations. A couple of minor technical issues have been resolved quickly by Jonas and he is always available to discuss any aspect of the motorhomes operation. We have no hesitation to recommend Jonas and the team at Zion Motorhomes for exceptional service and a great product. After ten years of motorhoming in our 7 metre Toyota Coaster we decided to up grade. We visited the Covi show two years in a row and finally decided on a Dethleff Esprit. Chris and Di were our first contact and they have gone out of their way to make sure everything went smoothly. We have had a couple of small problems which have been dealt with very quickly. Thanks very much to Jonas for picking us up at the airport which didn't happen (plane grounded at New plymouth) to picking us up the following day. Chris for always being at the end of the phone when we had a query. Our new motorhome has been all what we expected and more. Hopefully we can enjoy many more years travelling around New Zealand. Thanks for you call re successful sale of our motor home. Job well done and appreciated. Was best to go with those who know and have the knowledge, so pleased that you followed up re Jonas background work. The whole process from dealing with Jonas initially for the purchase to the resale with yourself was very professionally handled, Dethleffs have made a good choice with their New Zealand agent/agents. I have purposely waited some time before giving you feedback on our Dethleffs Magic Edition RV until we had used it enough to warrant our opinion. We have had it now for 9 months and have traveled over 16,000 kms around NZ. We have totaled 164 nights in it to date and I have to say it is absolutely awesome to travel in and to live in. My main criteria before purchasing was that it would not be too big, would be easy to drive, and only require a standard driver's license, would be essentially set up for 2 with a permanently made up bed (but able to sleep 4 ( if need be)), and have lots of room for toys and fishing gear. It covers all of these requirements categorically. (In fact Julie does most of the driving and I kick back in the passenger seat a lot of the time). On top of that I just love the cruise control, the diesel economy and that 1 key operates all the doors and hatches. Makes it so easy and pleasant to use. All drawers and cupboards are well laid out and very user friendly, and the lighting and heating system are second to none. I still get amazed at the difference between inside and outside temperature without anything on. The design features of this model make it simply superb to take to the road. Many people have admired it and asked how we find it? I tell them "it's perfection on 4 wheels" and we just love every moment in it. So thank you very much for our mobile home and you might see us back once we've been round the clock a couple of times. In April 2016 we purchased a Globetrotter xli from Jonas of Zion Motorhomes, and can honestly say are extremely proud and happy to own this vehicle, in particularly the after sales service Jonas and his team has given us, frankly its second to none!. For us, the decision to buy a Dethleff came about came about after directly comparing our then NZ purchased British motorhome to a Dethleff Advantage that our friends had just newly bought from Jonas. When travelling with our friends and parked side by side over the teacups conversation was interesting with debate and conjecture, we were able to directly compare the pros and cons of both vehicles, and yes in the end agreed that both vehicles were beautiful but consensus was the Dethleff had the little extra we all really liked, that said & most important for us was the after sales experience Jonas offered & that our friends kept labouring about, this eventually swayed us in the end! in short Jonas coupled with the Dethleff brand for us was the ultimate package we were looking for, we seriously didn’t think it was possible to find this after our previous experience with another brand............The decision to change brands was made easy for us. Empathy and the ability to listen, Jonas offers these with enthusiasm and scale, not forgetting the after sales customer care, this is really where he shines! & this was what we were really looking for in fact we were envious of when our friends spoke of this. Having previously owned an imported Motorhome naturally we were cautious, after sales customer care was high on our priority list, our previous experience was not the best, but it was at this point our friends began to share their positive experience they were having with Zion Motorhomes and we decided to investigate further. After purchasing our Globetrotter we are very pleased to say we have experienced what our friends experienced that Jonas does actually walk the talk! ....... as in the end word of mouth is the very best form of marketing, and we hope to reciprocate our experience with others when given the opportunity. Long may success continue for Jonas and the Dethleff brand here in NZ. We were already Motorhomers with a 7 meter bus converted to an excellent standard & had 8 years seeing much of NZ in her. Looking to upgrade we wanted a permanent double bed, separate toilet & shower plus more storage as minimum requirements. We looked at European & Australian brands over several months but we were being very choosey & were not prepared to rush our decision. Our Friends had a Dethleffs Motorhome & we kept coming back to look at theirs. We finally chose a Dethleffs Advantage model but had to wait while it was placed in the Covi show & picked her up after the Show finished. We decided on Dethleffs not because of price but because of its quality of finish, attention to detail, & design layout. It had everything we were looking for & more! Off to the South Island within 4 days of delivery she never missed a beat, all systems functioned really well for the 7 weeks of that trip & subsequent journeys since!! We were really impressed with the intimate knowledge Jonas had for his products when he took us through the pre delivery checks especially relating to the electronics, many of which were new to us. We are very satisfied with our new Dethleffs Advantage & would recommend Dethleffs to anyone as Best in Class! After making the decision to upgrade our motorhome, we decided to buy the Dethleffs Magic Edition T4 and made a visit to Jonas and the team at the Covi Motorhome Show in March 2016. The maiden trip up north with friends proved our decision to be the right one, we are very pleased with the van. Easy to drive and tons of performance from the 180hp Motor. We have now done 3000kms and any teething problems we have had, have been resolved by Jonas and Chris in a very professional and friendly manner. The van suits us down to the ground and we look forward to exploring all parts of New Zealand in the coming years. Being owners of motor homes for the past 15 years we had definite ideas of what we wanted in our new van. Top of the list was an island bed, separate shower, plenty of storage, not more than 7metres long and on WOF not COF. It was difficult to find all of this in a small vehicle that met our criteria, there were other brands we investigated but the build quality of the Dethleffs seemed better.Jonas and his team of Chris and Dianne at Zion motor homes in Howick were a pleasure to deal with which helped make our final decision which company and which brand we would choose easier.The team at Zion motor homes fitted the extras that we asked for at a very reasonable price, this included a rear ladder as I like to have the convenience of quick access to clean the solar panel and around the hatches, they fitted alloy wheels and plugs for a 2nd TV. We have owned the van for almost a month now and have travelled our first 1500km, we are extremely happy with it and have not found any fault. In fact we are very pleasantly surprised at how much better it handles than our previous similar size Autotrail, probably due to the lower chassis and consequent lower centre of gravity. From the first 2 diesel fills it has proved more economical as well which we attribute to being a bit lighter.The van is all that we expected and more. Thank you Jonas and team, we thoroughly recommend you to any prospective purchaser. It would be a pleasure to write a testimonial. The initial trip up to Auckland to meet Jonas and check out Dethleffs at Zion Motorhomes started out badly when I got lost looking for the Howick depot. I was on my motorbike so GPS wasn’t very convenient. After a quick call to Jonas I was relieved when he asked me to stay put and he would come get me himself. There were plenty of vehicles to see and lots of info to absorb at that first introduction, as I had no previous experience with motorhomes at all. Jonas was more than helpful, giving me a very full and enjoyable “tour” of the several models on show. I decided to bring Judith up from Hamilton with me next time, and once getting home that afternoon, we set a date, 3 weeks away to visit Zion Motorhomes for a second look. Upon arriving again 3 weeks later in March, I Introduced Jonas to Judith and we showed her the Dethleffs Trend, which I had thought might suit us, but she liked the new Magic T4, which is larger. Who am I to argue with my wife who wants a bigger motorhome? We were shown all the various features over about an hour, with Jonas looking after several clients at the same time, which gave us opportunity to discuss our likes and dislikes with each other, which was good. We were both very impressed with the Dethleffs brand, and had had Dethleffs recommended to us indirectly through Bruce and Judy Philpott. Although we had never met them,we knew Bruce and Judy to be a discerning couple and this was our main deciding factor. We left for Hamilton with the knowledge that two out of the three Magic T4’s were already pre-ordered and spoken for, but that there was one, somewhere between Auckland and Germany, that could be ours if we so wished. What a position to find ourselves in ! Either we could take all the time we wanted and decide at a later date, then we would have to wait at least 6 months for the next shipment to arrive from Germany. Or, we could pay a small deposit now, and take possession of a brand new motorhome in just a few short weeks. We were ready, and Jonas was willing to put our name to the third T4 that was on it’s way. Bussing up from Hamilton (sadly Judith could not get time off work) I duly took possession in early June and after a couple of hours with Jonas going over the various operations, I found myself at the wheel for the first time ever, driving a beautiful motorhome back to Hamilton with my four year old Grandson sitting next to me. I found the T4 surprisingly easy to drive and not that much different from our Toyota Lucida from 10 years earlier, although the T4 is 7.6 metres in length. It’s with much thanks and gratitude that Jonas reassured me before leaving the yard that I should not hesitate to phone or text him should we have any difficulties or questions regarding our new motorhome. I joked that I might need some advice at 1 o’clock in the morning, but he took that as a legitimate query and said that would be fine. Well we needed just such help the following week when on our very first night away in Maketu, although fortunately it was considerably earlier than 1 am. After no less than half a dozen texts and a couple of calls to Jonas, he was able to get us clear on a few points concerning the Truma heating, the Dometic fridge and operating the Satellite Dish TV. We are very happy with our Motorhome, although recently we have not been able to do much travelling due to other commitments and not very good weather. We have however taken the opportunity to do a few minor alterations and additions to improve the use of storage space. Now we can't wait to travel to the South Island. Looking forward to the Dethleffs owners get together. We understand that you will already be aware that we had problems with our water pump a week last Friday. We are pleased to report that despite only calling Vantage RV the evening before we received excellent service with the pump being replaced within the hour (we should also mention that they were very busy at the time with campervans everywhere). A big thank you to Vantage RV. All the best. We are really enjoying the new motorhome and in addition to staying the first couple of nights in the Auckland area we have spent a few nights at a couple of the local DOC sites in the Far North. The garage is a real bonus with the capacity to house bulky items without the need to spend hours shoe-horning them into restricted spaces. We will be pleased to provide a testimonial and below we have drafted out a few words that you may wish to use. I had never considered buying or even been away in a motorhome until I was introduced to the idea by friends in the far North and became very interested in the concept. I spent a few months investigating all the options and visited all the main suppliers in Auckland. From the outset I liked the style of the Dethleffs motorhomes, and although the other options offered many positives, I kept gravitating back toward the Dethleffs. When I buy anything, there are two critical criteria. 1. The quality and suitability of the product and 2. The integrity of the people I am buying from. When I visited Zion Motorhomes in Howick and met Jonas and Chris, I knew immediately I had met the people I wanted to deal with. Then I began to investigate the suitability and quality of the Dethleffs range in more detail and my mind was made up. I bought the Dethleffs Globetrotter Xli as I planned to do some extensive touring around the many less visited and remote areas of NZ that few are fortunate enough to see and wanted a home on wheels. The Globetrotter has been everything I hoped for. It is spacious, top quality throughout, comfortable and the systems are very well designed and engineered. Fuel economy has also been a positive surprise and handling on both sealed or gravel roads has been excellent. I feel incredibly proud driving the Globetrotter and get many admiring looks and thumbs up wherever we go. As with any new vehicle there have been a few minor teething issues, but these have been quickly rectified by Jonas and the team. This has given me 5,500kms (in a little over 2 months) trouble free motoring and enjoyment. I am very happy to be a proud new member of the Dethleffs/Zion family in NZ. We met Jonas and his staff at the NZMCA AGM at Pukekohe where he had a range of Dethleffs motorhomes on show. At that time we were contemplating upgrading our existing motorhome and were carrying out research. We got the impression that Jonas and his staff were very professional and were very honest and sincere in their product. A few weeks later we put a deposit on a Dethleffs Magic Edition motorhome and looked forward to its arrival from Germany. We have now covered 5,000 kms in the vehicle so it has had a good test. There has been a few minor faults which is to be expected with a new vehicle. Jonas referred us to his workshop at Vantage RV in Peters Way, Silverdale, who were very accommodating and we were very impressed with their attitude and workmanship. In June 2015 we took possession of our Dethliff’s Magic Black Motor Home. It had been ordered at the Covi Motor Home Show in the previous March. After a great deal of research we recognised immediately the superb finish, design and manufacture of this particular motor home when we saw it. Impressive too was the knowledge and help that we were given by Jonas Ng the managing director of Zion Motorhomes. The assistance we received from Jonas was not just at ‘the Show’ and on delivery of the vehicle but continues on. Nothing is too much trouble as he has patiently told and re-told us how certain things work. After using it now for the past 8 months I can say that neither my wife or I have been in anyway disappointed. We have spent many happy hours touring round and fully enjoying our Magic Black. Both my wife and I can and do drive the vehicle as it only requires a car licence and it is easy to drive. We are thrilled and most impressed with the Dethliff’s Magic Black performance and the customer support that we have received from Zion Motorhomes. As a couple with experience of nearly twenty years ownership of various Motorhomes we had very definite idea’s about the criteria our next Motorhome needed to meet. After lots of research and checking out different Motorhome Companies product; then two visits to Zion Motorhomes Ltd in Howick, Auckland our decision was made easy. The White Magic Edition T7151-4 met all of our requirements and wishful expectations. The low key approach, product knowledge and the helpfulness of Jonas and his team of Chris and Dianne made the process of the purchase of our new Motorhome easy and pleasurable. After a three week shakedown cruise to the far North; all the boxes were ticked to our satisfaction and we knew that we had made the right decision to purchase a new Dethleffs Motorhome. We would recommend to anyone considering the purchase of a new Motorhome, put Dethleffs Motorhomes on the top of your wish list and visit Jonas and the team at Zion Motorhomes Ltd.
We are writing to thank you for your excellent service during the purchase of our new motorhome. The service we received has been outstanding and our every request has been dealt with quickly and efficiently no matter what time of the day or night we rang you. We are very happy with our Sunlight T69S. The layout is light and airy and very practical. The vehicle is a dream to drive. We've just returned from a trip round the South Island and are very happy with its performance. We have already shown our new motorhome to two interested couples who are very keen to buy from you and are going to contact you directly. We have no hesitation in recommending Zion Motorhomes, both for the excellent service and the high standard of vehicles you are selling. In late 2015 my partner and I purchased a new motor home through Jonas and his team. The service we received was exceptional. Small misunderstandings were quickly and efficiently ironed out in a most friendly and obliging manner. The high quality of assistance we received did not stop abruptly once the transaction was complete. Any request we have since made for advice or whatever has met with the same degree of friendliness and efficiency. We cannot speak highly enough of Jonas,Paul and Deborah and would recommend them without hesitation to any potential motor home purchaser. Trevor Burton and Maureen McDonald. In August 2015 we purchased a new Dethleffs Globe 4 motor home from Jonas at Zion Motorhomes in Auckland. Having had a motorhome before we knew what we wanted in our next one. The Dethleffs Globe 4 filled our requirements in a motorhome. First it has a powerful 3.0 litre 6spd auto engine, great for those hills. The dining area is spacious for entertaining with swivel front seats. The queen size island bed is made up and ample storage throughout the motorhome. Lastly the garage at the rear was a must for travel storage. The service we have had from Jonas and Chris is outstanding and we can only praise their after sales and service. If you have a tick list we can recommend our Globe 4 and we regularly have tours through it! We have recently purchased a motor home, after in depth research and trial. We decided on a Dethleffs White Magic from Jonas. We had a wish list, and we are "critical" customers. Congratulations Jonas you and Dethleffs met the criteria. The Dethleffs we decided have the comfort stability, and finish, with all the extras totalling a real bonus. Jonas we discovered is a real treasure to deal with. He is knowledgeable, patient, fair, and more than helpful. His staffs are cut of the same cloth. When we were unable to pick up our motor home because of recent surgery, Jonas agreed to have Chris deliver it some 800k from Auckland Chris was very thorough in his introduction of the motor home to us. In short we are very happy campers. Neville & Sue Bailey are the very proud owners of a new Dethleffs Magic Edition A Class i1DBM. We love the lay out and the excellent quality, that Dethleffs Motorhomes have. We are looking forward to spending alot of time and exploring many new places. It was a real pleasure to deal with Jonas and his team. Dethleffs have a great asset in Jonas, with his strong interpersonal and communications skills ,that allows him to develop a great working relationship with his clients. Thanks again Jonas and all the best for the future. We would highly recommend Jonas and his team, and would have no hesitation about purchasing another motorhome from them. Regards Clive and Celia Bartup. We have been shopping since Feb 2015 looking at all options from carvan, 5th wheeler to Motorhome and during this time had viewed many options and dealt with many people in the industry. Jonas provided us excellent service demonstrating a thorough knowledge of his products. He gave us time to view the various Motorhomes he had in stock and detail the different features for us, all the while allowing us to decide which features best suited our needs. We have found Jonas to be patient, considerate, reliable, a timely communicator who has good honest values which has been evident in our dealings with him. We are first time Motor homers but have been boating for many years. Our intention is to live in the Motorhome we purchased, for at least 12 months, while travelling New Zealand. This influenced our decision to purchase the Globetrotter Xli. The vehicle has numerous features which make for very comfortable motoring/living. The many automated features and controls including the electric step, electric awning, automated satellite dish, electronic looking of kitchen cupboards and automatic power selection for the refrigerator all make for very simple set up and hassle free departures. The kitchen size and layout makes meal preparation easy with good storage, easily accessible. The location of the oven above the fridge/freezer is difficult for shorter people to access. The oven is slow and cooking is uneven. More practice may resolve some of these issues. The fridge/freezer functions well. A wonderful feature, which has made for very pleasant winter travelling, is the electronically controlled ALDE heating system. While motoring, the engine can be used to run the heating system. Gas or 240V used at rest with a constant temperature able to be maintained throughout the night, if wished. All easily controlled with a touch pad. The heating runs throughout the Motorhome, including the garage and wardrobes ensuring dry conditions throughout. The Motorhome easily achieves 6 to 8 deg warmer than outside temperature, just with the construction style and the double glaze window and double flooring system. The large garage has proven very valuable as we can house bikes (5 on one occasion), outdoor shoes and coats, BBQ, laundry and numerous other items. The underfloor storage spaces accessed from the exterior are great for storing fishing rods, outdoor furniture and other items too. We love our adventure in our Globetrotter Xli having travelled the Coromandel, Bay of Plenty and Northland over the last 3 months. We have tacked gravelled, steep Coromandel roads finding the auto/manual transmission valuable. We are very happy to recommend the Dethleffs product and the services provided by Jonas Ng of Zion Motorhomes Limited. Purchased date July 2015 - Ivan & Kerry Clarke @ Queenstown. I had my arm twisted into doing a relocation of a rental Motorhome from Queenstown to Auckland. We’d tag along behind our friends who had just bought a fancy new one. By the second night as we bedded down with an ocean view we were hooked. Upon returning home we joined the Motor Caravan Association and started in earnest researching our options to order one of our own. This began by the process of elimination. Whilst this was all new to us, we were very familiar with living aboard confined spaces on cruising yachts where clever design and well-engineered components are essential to enjoying the life-style. To us the Dethleffs range stood out from the crowd, they also look stunning. The quality of build, the engineering and the ingenious design details caught our attention. The economy of scale of large European specialist production factories reflects in the end product delivering 21st century products and design second to none for a price, that we thought most reasonable. Appeal, function and resale all had to be considered, but mainly after-sales support. We met Jonas of Zion Motorhomes at his yard in Howick, from what I’d heard it seemed he’d built quiet a reputation of service, customer care and above all integrity. As he soon pointed out to us, he believed the essential ingredients to his success in the business was firstly an excellent product with support by the manufacturer but most of all personal customer care, the Motorhome community is very close-knit so it has to be right. We ordered an A-class ADVANTAGE in Silver with the extra bits and couldn’t wait to take delivery. Just after, we saw a Dethleffs parked by the Auckland waterfront, we called over and said hi. How thrilled the owner was of his choice and spoke so highly of Jonas. Nicely timed, a few months later Jonas picked us up from the Airport at an unearthly hour in the morning we’d endured a long-haul flight, He had our new toy waiting for us at his place. An hour or so later after full briefings we were on our way ready for our shake-down. We went the long way home to the South Island - via Whangarei. We met up in convoy once again with our friends South of the Bombay’s, we were loving it. We couldn’t commend the Dethleffs product any higher, or Jonas and his team, he’s a man who comes highly recommended that we too can now also vouch for. Just a week ago I got to thinking…that’s a pretty big windscreen, what if the unthinkable happened, I ran it by Jonas, he responded, don’t worry, he’ll always keep a spare on hand for you. How’s that for consideration, I thought a good word was in order. Ivan & Kerry Clarke – Queenstown. P.S. I now hear my pal is in serious discussions about swapping his new motorhome for a Dethleffs. Purchase date May 2015 - John and Denise Anstice @ Rolleston, Christchurch. In May 2015 we were the first people to take delivery of a Dethleffs motorhome from UCC in Christchurch. We have dealt with Ross and Rob Floris for over 10 years and have always found them to be very friendly and professional, so we were delighted to find that they have added Dethleffs Motorhomes to their product range. Our main requirements were for an Island bed and a garage to take bike, inflatable boat and mobility scooter. An open weekend at UCC had a Magic Edition White on display and we decided that it fitted all our requirements, and a deposit was paid that weekend. We did not want anyone else to get it and have us wait for another shipment as it suited us that much. We have found the quality to be first class and the ride exceptional compared with other motorhomes we have owned. Its stability feels as good as or may be even better than our cars. Our first trip away was to the top of the South Island and even with winter temperatures we were comfortable and cosy in our well insulated home. The Truma Combi heating and hot water unit worked perfectly and automatically once set up. The compact “GourmetCenter” kitchen works well for us. We find having the oven below the gas hob works well as we do not have to stretch to use it. There is plenty of storage inside the motorhome as well as in the garage, the floor storage spaces are especially useful. We can recommend Dethleffs Motorhomes to all who are looking to purchase a high quality, exceptional value motorhome. They will not be disappointed in their purchase. We have been very satisfied with the Globe4 motorhome we purchased from Jonas at Zion Motorhomes in February 2015. We were newcomers to motorhoming after having owned a German manufactured caravan for two years previously but felt a motorhome would better suit us. Having spent over thirty years living outside of New Zealand, we intend to see and experience as much as possible of our beautiful country. After much researching, talking to many people with motorhomes and visiting a number of importers of European motorhomes in Auckland, we decided to buy a new Dethleffs being fully appreciative of the quality that German-made caravans and motorhomes offer. Jonas was so helpful and patient with us as we considered the extensive range of models and optional fit-outs Dethleffs offers. Finally we decided on a Globe4 and with Jonas’ help, we were able to have one built to our own specifications. We have been extremely pleased with our new motorhome, as well as with the prompt, efficient, helpful and courteous service Jonas has provided us pre- and post-delivery. We have by now travelled through most types of roads we will want to tour over and have experienced colder than normal weather conditions this winter. We can confidently say that our Globe4 has met our expectations in terms of its high quality build standards, performance and comfort. Driving is a pleasure with plenty of power from its 180hp 3 litre motor and it has a ton of storage space which we are still learning how to maximise. Thank you very much Jonas, to you and your capable team, for helping us to realise some of our retirement dreams. We thoroughly recommend Jonas and Dethleffs to anyone contemplating purchasing a new motorhome. We took possession of our new low profile Dethleffs Magic Black motorhome on 1st June 2015, complete with 360 degree camera fitted at factory. The previous van we owned was a 7 metre bus conversion, a lovely van, very highly spec. Owned for six years, however the interior layout was no longer user friendly so it was either a case of making alterations to what we had or purchasing a new one. The three priorities in our new van purchase were Island double bed, Low profile easy entry steps from outside to interior, swivel front seats at front lounge area. Other features such as large fridge-freezer were a bonus. We were not able to attend Motorhome Expos to compare the different brands available. Contending with crowds of people together with getting in and out of vans was not possible for us. The initial research was made off the internet as all brands seem to have available all specifications and information that is required. Sale brochures, I believe are becoming a thing of the past as all information, photos etc. can be printed from the websites. Jonas and the Dethleffs brand have an excellent website set up. After spending considerable time comparing what was available on the internet websites, we believed we could get what we were looking for from the Dethleffs range of models. Just returned from a ten day away trip (July 2015) touring the Coromandel Peninsula with friends in their van. Freedom camped the whole way with no issues with hot water, interior heating or battery power problems. The electrical technology, fittings, van layouts, value for money, general finish in European brands, we believe are superior to New Zealand made. Magic Black is a lovely van to drive, a good looker, plenty of power, Queen Island bed, large fridge-freezer, leather upholstery, large storage area in garage at rear. Very happy with our purchase Jonas and will keep in touch. We purchased a T7051 Advantage motorhome from Jonas at Zion Motorhomes 8th April 2015. This was after considerable time investigating the market, comparing brands, design options and prices. Our first decision was to look at the Dethleffs range of models available and to discuss these with Jonas and his team. Our second decision was to ensure that we felt comfortable with the sales personnel as well as the product. The T7051 is a very comfortable, well ventilated and superbly warm machine for winter travel. Even with a –3 degree frost outside, we had no signs of condensation indoors. With the large solar panel, two house batteries and gas bottles our range is only limited by our toilet cassette. And with the extra-large storage garage there is plenty of room for an extra cassette, our next purchase. As Jonas suggested we weighed our bulk items going into the storage garage just to get some idea of gross kilos and to ensure we were well within the max recommended, these included, two fold down bikes, two inflatable kayaks, two full sets of golf clubs and assorted tools, fishing rods, camp tables and chairs etc. still lots of room....Great storage. Having opted for the larger 3 litre motor we have plenty of power should we wish to tow at some stage. The drivability is that of a large 4WD, plenty of passing power, comfortable cornering and pretty good fuel economy. Our only concern is that of rear visibility. Although the wing mirrors work very well we have had instances of cars and motorbikes tailgating and having difficulty seeing them. To that end we are having a rear window fitted shortly which I am sure will help. Jonas could not have been more helpful. If we had a query that he couldn't sort straight away he would call back with the answers ASAP. He explained the differences between models and then left us to wander around doing our own evaluation for what we wanted our motorhome to achieve. We had more questions and Jonas had more answers, he impressed us with his knowledge and practicality and more importantly he made us feel comfortable with our choice of purchase and Zion Motorhomes.. If you are looking for a new motorhome we recommend that you talk with Jonas at Zion motorhomes and inspect the Dethleffs range.. I am the proud owner of the above described vehicle having purchased new in January this year. Prior to purchasing the vehicle I thoroughly examined the Campervan market and also gave consideration to my personal requirements and of course resale values. Initially I was looking for a 2 berth vehicle, second hand and a lot cheaper than my final purchase. It soon became apparent to me that I must consider other peoples requirements and in the end it was a no brainer, a 4 berth van and new as the miles will still be low when I sell in comparison with other vehicles on the market thus I will get my best return on investment. When I first visited the Zion Buy Campervan site in Howick I was very impressed with the approach by staff and I later met with Jonas who continued that friendly and honest approach. I have had new vehicles before and I can categorically state that the backup service has been unequalled. Being a very keen yachtie with keelers and having gone away on long treks on the ocean I was still a little hesitant when I bought the vehicle particularly some of the little gadgets and the vans self-containment, but this was soon erased not only after trial runs but whenever I had a query no matter what time of day all I had to do was ring Jonas for back up help and support. My vehicle is about 7.6 metres in length excluding the cycle carrier yet when driving along I feel like I am driving a car it is so comfortable, certainly not like a normal large vehicle. The motor is extraordinary 3litre turbo charged I can easily keep up with other vehicles and Oh’ the cornering and hills are just so easy. As for comfort when staying at my destination I have everything imaginable even my Sky TV and microwave and luxurious comfort. It is such a joy to park and stay the evening. I regularly admire the van and say to myself “you are lucky bugger” such is my joy with this vehicle. To confirm I have made the right choice in vehicles all I have to do is listen to passersby and friends who all drool over her. Yep, I’m a lucky bugger alright. We are pleased to write herewith our testimonial. We took delivery of a Dethleffs A class Globebus i8 motorhome from Jonas of Zion Motorhomes on 1st February 2015. We initially ordered in June 2014 and over the intervening period requested various additions to the model ordered such as cycle rack, ladder, barbeque, gas outlet and extra 12V supply for our inverter. All of which were supplied without any problem. On arrival Jonas gave us a thorough introduction to the vehicle operating systems, which was of great assistance as we were very new to the motorhome fraternity, and driving back to Wellington that morning. The interior finish, colours, carpet and upholstery are very well coordinated and this model has a separate shower opposite the toilet and basin. A sliding door separates the bed, shower and toilet from the living space affording complete privacy. The galley though not large, we found very manageable, with good storage for all cooking utensils, cutlery, crockery, glasses and food. The gas hobs and oven more than adequate, with an excellent 3 ways refrigerator and separate freezer . Having not driven a vehicle of this size before we were amazed at how well it handled, the 2.3L motor offers excellent economy and good power for the fully laden vehicle. Being A Class with pull down bed, 6.7m long and 2.15m wide it is a very compact model.As this model has a full width garage, plenty of storage is available for all of the gear that would be inappropriate inside the motorhome. The vehicle supplied to our colour choice has a high finish for ease of cleaning and future maintenance. Jonas has remained easy to contact and assist with any minor queries we have had. In short we absolutely love our motorhome and have no hesitation in recommending both Jonas and Dethleffs as the supplier and vehicle of choice. The Trend is deservedly one of Dethleffs most popular selling models in NZ. My wife and I spent three months checking out motorhomes of this type being sold in Auckland. The Trend ticked almost all our boxes and now we have been using it for the last four months the ones that it did not tick do not seem to matter much now. We found Jonas at Zion Motorhomes a pleasure to deal with. No high pressure sales stuff he showed us through the Trend motorhome and others so we could compare the different models. He answered/ showed us all we needed to know and when we wanted to see if we could get some changes /extras he obtained answers from Germany in a couple of days. When we weighed it all up we concluded the Dethleffs Trend offered the best value and quality for money that we could find and our experience, using our one over the last four months, has borne this out. Overall we are very pleased with our Trend motorhome and with our dealings with Jonas. Would we recommend purchasing a Dethleffs motorhome from Jonas at Zion? Hi all, we purchased our Dethleffs Sunlight T69S motorhome from Jonas, Zion Motorhomes LTD back in mid January. It’s now March and we have been on the road 5 times since. The longest stay away was 5 days and all without AC power. Well you wouldn’t know it. Has got a great feel to it, comfortable and a great drive, all the power you need on the road. Thanks Jonas for the easy purchase, help and pick up from the airport etc. We have had nothing but great feedback from all our friends and family that have seen it (wont to borrow it). Thanks for the very quick response with our little hiccup with water pump, all sweet now. Was the choice after research on internet and reading articles in Motorhome Journals. I contacted Jonas at Zion Motorhomes Auckland about Magic Black i1DBM. After a few phone calls, Jonas offered to fly us to Auckland to view one but we thought was a waste of money so we ordered one anyway. Took a little longer than expected to arrive but got 2015 model well worth the waiting and was more than expected as Jonas promised it would be. Storage is amazing, great bed, kitchen not big but works well. Bathroom cabinet great, shower shut off toilet, it goes on great driving the 3.0L Fiat engine. Have owned caravans about 40 years ago when our family were young but believe this is the way to go for now. My wife's Val was never want to go on holiday and leave home. BUT NOT ANYMORE !!!! Would recommend Zion Motorhomes to anyone wanting a Motorhome as we found Jonas great to deal with, nothing was any trouble and he looked after us very well. Thank you Jonas & Irene for your hospitalty. "Thank you Jonas for making our dream comes to fruition. We purchased our Dethleffs Black Magic Edition Motorhome just over a month ago and with its superior finish couldn't be happier. Your dedication to exceptional customer service far exceeded our expectations and we have and would highly recommend Jonas from Zion Motor Homes to anyone contemplating a Dethleffs purchase." We have now had our Dethleffs Esprit for over two months and have managed to get away in it most weekends since then. This motorhome has certainly met and exceeded all our expectations, which were very high given the length of time I had been dreaming of owning such a "bus". The finish and engineering detail of the Dethleffs is the envy and awe of all we have shown it to, and the vehicle has been a joy to get away in. Thank you Jonas for the genuinely helpful and patient way you handled the whole sales process. It certainly has been a pleasure doing business with you. I can wholeheartedly recommend Jonas and Dethleffs to anyone contemplating such a purchase. We would like to make it known that we have just purchased a Globe 4 Motorhome by Dethleffs, through Zion Motorhomes Ltd in Auckland, which we are extremely proud to now own and show off in the South Island. Although we have only travelled 2000 km in it, we have had an unbelievable number of people knocking on our door, asking us to show them through. All with very positive comments. As we live in Kaitangata, just east of Balclutha, we were worried about distance when dealing with such a major purchase. However, after making initial contact with Jonas, who answered all our questions and concerns promptly in a very courteous manner, this started us on a journey to Auckland, where Jonas met us at the Airport, feed us, took us to our Motel and delivered us back to the Airport after the deal was completed. As we had to fly back home, Jonas delivered the Motorhome to Christchurch for us, so after worrying about distance, we found that Jonas and Zion Motorhomes made the whole experience extremely pleasant. They were easy to deal with and we would thoroughly recommend that anyone thinking of purchasing a Motorhome should contact Jonas at Zion Motorhomes and ask about Dethleffs products. They are very easy to talk to, you will be treated like royalty and you will be driving home in a product you will be extremely proud of. Well done Jonas and Dethleffs, it’s only very special people we put on our Christmas list. In September 2014, I purchased a Dethleffs Sunlight T69H Motorhome from Zion Motorhomes Limited. I have now used the Motorhome for approx. 3 months covering 3500 kms. I have been impressed with the quality of the Motorhome. The performance of the Fiat Motor and componentry has been impressive and the design and functionality of the Motorhome itself is efficient and effective. I believe the advice and information I was supplied with at the time of purchase was fair and accurate. Following purchase, I received efficient and prompt follow up service. I am quite comfortable recommending Zion Motorhomes Limited as a business with intergrity and would have no reservations in dealing with the company again. Michael and I would like to thank you for all your support and for making it possible to have our new Dethleffs Motorhome in Europe for three months before taking delivery of it (for the second time) in New Zealand. All the paperwork done, insured, registered and on temporary Swiss plates. Delivered by truck to our Zurich hotel with zero miles on the clock. We had a marvellous time exploring Switzerland, France and England in comfort and style. So easy to drive and very comfortable to travel in, with a bird's eye view of the countryside. How wonderful to be able to stop for a rest and a snack. To take it to a new level some French supermarkets even have overnight camping sites. Many wonderful memories of places and people. Thank you Jonas for making it so easy to do. It was great to see our Motorhome here in New Zealand with all its N.Z. requirements taken care of. We now look forward to many more wonderful times here in New Zealand. Thank you again for your cheerful unstinting support. Have just returned from the first Dethleff Motorhome outing at Miranda and such an enjoyable weekend was had by all. We are new owners and it was good to mix with like-minded people and yourselves and chat about our vans etc. I think we all gained a lot from the outing. We would also like to congratulate you on the turnout I think 29 Motorhomes are now here and 24 of the owners set aside their time to be there with you and other Dethleffs Owners, shows how much they appreciate the care and service you provided with their purchase. We look forward to many happy travels in our ‘Black Magic’ in the future. We recently purchased a Dethleffs Motorhome from Jonas. We are very happy with the quality of the motorhome. We were very impressed with the way Jonas explained everything and with his product knowledge, Nothing seemed to be too much trouble . I would certainly recommend him to anyone wishing to purchase a Dethleff Motorhome. Our experience in purchasing ours was certainly a trouble free and pleasant one. I am pleased to provide a testamonial about our experience of buying the Dethleffs Trend motorhome. The whole process was completed very smoothly. All the documentation for certified self containment, registration and compliance was expertly attended to. All the extras like reversing camera with GPS, Awning, TV, 190W Solar panel were fitted in a workman like manner. The extra house battery was a welcome surprise. We have used the van at two motorcaravan get togethers and everything works! The 150 hp engine provides all the power needed to cope with the hills. The forward seats are easy to turn making a cosy lounge. There are lots of other positives that I could detail but that is enough. Thanks for the photos and for facilitating the first owners club weekend. We made lots of new friends. In fact we met with Gary and Dianne again this weekend and had another lovely time with them. We are really enjoying our motorhome and whenever we come home we cannot wait to go out again. The motorhome is easy to drive and very comfortable to live in. Our dogs think it is a luxury kennel and they love going to new place, sniffing new smells and swimming in new waterways. We took delivery of our Dethleffs Trend edition T6857, on 8th of April 2014 and left two days later for 6 weeks in the South Island. We are very pleased with our purchase. The van has everything we wanted an Island bed and a large fridge freezer and plenty of storage space, we have owned other vans, and have found this one to be exactly what we had been looking for , it is very comfortable to travel in. We found it most enjoyable to drive and we were very impressed with the fuel economy. We purchased a Globe 4 in July 2014 after looking at many competing brands and models. We'd just completed a 3 week trip in a 12 ft european caravan around the South Island and were looking for something that we could go fulltime in and with more space. The Globe 4 fitted the bill perfectly and with the better build quality and better value for money than many, was an easy choice. We did have a few early niggles which, having come from a Launch background, we expected but Jonas was onto them and they were quickly dealt with the next day! .. Amazing service. Even with the odd text message on the odd Sunday when we had questions was never a problem so thank you for your patience Jonas. I have no hesitation with recommending Jonas for your next Caravan or Motorhome. I'm very much looking forward to the upcoming Dethleffs NZ Owners Group. Thanks again Jonas for your amazing service. We are so pleased with the service that you have given us during the process of buying one of your Dethleffs motor homes. Your attention to detail was excellent and keeping us up to date was very important to us, as it was a large financial outlay. We would absolutely recommend you to anyone else looking for a new motor home or caravan. Also we would be happy for anyone to contact us regarding anything further to do with buying this very pleasureable motor home. Thank you for your being somebody that we have been able to truly trust. Re our Dethleffs Trend motorhome, we are very impressed with our new purchase of our motorhome. We are also pleased with your service and quick response to any of our queries. We are so pleased we decided on your product and look forward to many happy km's travelling. As we mentioned to you previously we are happy to help out at the next Covi show should you require any help, albeit giving out brochures, making cup of tea maybe some scones!!! !, should you require us just let us know. We first met Jonas Ng of Zion Motorhomes, when we went to place an order in October 2013 for a Dethleffs Trend 3.0L Motorhome, after deciding on the configuration we would hopefully be happy with. We found his knowledge of his franchise products to be exceptional and his help and understanding of New Zealand commendable. He and his wife obviously love living in New Zealand. Throughout the delivery Jonas kept us informed of shipping progress and possible upgrades/extras we could add. All of the other extras we requested were of top quality from the TV satellite control to the GPS/radio. On March the 4th 2014, we took delivery of our camper and immediately set off, via Napier to the South Island for a three week adventure. The camper was everything we could have expected and Jonas had made sure all our extras were ready to go and everything worked superbly. The Fiat Ducati base is very comfortable to drive and fuel economy good, with lots of power. Since taking delivery he has kept in contact to ensure everything is going well. We have no problem in recommending him and his company and wish him, his family and Company every success. After a lot of research went into buying my Motorhome, and choosing the right one with all my requirements, I decided on the Dethleffs Globe 4.With lots of help from Jonas at Buy Campervan, I got to choose the exterior and interior colour scheme, and add some extras. As I am a female on my own, I could not have purchased better. I love it. The Globe 4 is easy to drive, has a very good motor, and zooms up any hills. The interior is easy to keep clean, and the storage is amazing. The island bed is very comfy, and the shower roomy. The fridge is a good size. So is the oven. All very modern. Through these winter months, it has been warm and cosy. Jonas is always on hand to help with any questions I have. Yes I've had a few. Thank you Jonas for your patience, help, and the dedication you have shown me and my lovely Motorhome. The Dethleffs Globe 4. I would like to take this opportunity to thank you on behalf of John and myself, for the wonderful service you have provided throughout the process of our investigating and purchasing of a motorhome. As you know, I took a great deal of time researching the type of motorhome to suit our needs. Once I had identified that Dethleffs was the make of motorhome that appealed, I was grateful to find you as an agent based in New Zealand who could provide us with the full specifications in a professional manner. We are very pleased with our Black Magic Motorhome. It is well outfitted and of an extremely high quality. Jonas your service and support is what makes our purchase one of peace of mind - thank you for your integrity, your diligence and your professionalism. We have no hesitation in recommending your services. After camping and caravanning for many years, we changed to motorhomes about 20 years ago. Recently we found ourselves without a motorhome as an overseas driver took it from us. We were devastated, we knew we had to look for another one as we enjoyed the going away with friends and the touring around New Zealand. We started looking at second-hand and new motor homes for a while and we really went into the value for money of them all. We then came across Jonas’s add on Dethleffs motorhomes. We phoned Jonas to go and have a look at them, we knew what we wanted with an island bed, big fridge and storage for our folding bikes. When we saw the “Trend” we just fell in love with it. We explained to Jonas the situation that we were waiting for the insurance money to come so that we could finalise the purchase. He was so good, he held the motorhome for us and kept in touch with us all the time. When the money finally arrived we were so excited we could go and collect our new toy. Jonas was so great as he went over everything with us to make sure we knew how it all worked before taking it home. He has even phoned us after we took delivery to make sure we were happy with our purchase and all was going well with it. We are very happy and it is going extremely well, we are finding it so well built and comfortable both living in and driving it. We love our Trend T6857 and would recommend Jonas and Dethleffs Motorhomes to anyone. Thank you Jonas for the way you helped us to purchase our wonderful Dethleffs Motorhome, you certainly were so receptive and obliging. After doing our research and inspecting Motorhomes for months we found an Ad on the internet for the Dethleff brand of Motorhome. We touched base with Jonas and went to visit and look through it. After numerous visits we became the proud owners of the Magic Edition. We have not been disappointed. The interior has been finished to an extremely high standard, quality fittings, big fridge, lots of storage and the ingenious spare bed. We both love the Motorhome, the heating system is really efficient and the water pump is so quiet. We asked Jonas to put an awning on then we purchased a privacy room for that then we were away. The exterior is so sleek and looks great, the Motorhome is comfortable to ride in and has a great amount of power under the bonnet. We spend 3 months every year living and working in the South Island, our Magic Edition Motorhome has exceeded all our expectations, we love love love it. We highly recommend these well finished Motorhomes and Jonas and his team have always gone the extra mile. Any questions or issues we had have always been dealt with on the spot. Jonas and his family are very genuine people, it has been a pleasure doing business with them. In May 2014 we took delivery of a new Dethleff Esprit Comfort.We had been motorhoming for 10 years and wanted something different. We attended the Covi and Camper care motorhome shows and looked at them all and the Dethleffs models were in a class of their own and were priced right. We found JONAS NG and his team of helpers great to deal with and when we asked those questions about changes we wanted done - No Problem. Our vehicle arrived in the country and then we added a few extras like 2x190 watt solar panels,3 x12 volt batteries ,2000watt inverter,and a 12 volt power supply in the big back locker. We have since added another 120ltr grey tank. The i7150-2 model has the extra floor and can go down to very low temperatures. The heating system is wonderful and all lockers and cupboards and clothing are warm..The water tank and grey tank are fitted between the floors so cant freeze. Automatic temp control. We would like to thank JONAS and his WIFE for the great service that they give the DETHLEFF product and would recommend them to anyone who wants a great genuine deal. You wont regret it. By the way Jonas wife cooks great chinese. We must learn to use chop sticks. We have over 20 years of camping experience and we had camper vans and caravans during this time. When we decided we wanted to have a "no compromise" camper van this time we decided very early that we want to buy a Dethleffs. On our first trips we were very happy to experience the perfect layout (island bed, sitting arrangement in the front) but also the necessary small details like a fast and very smooth and silent operating heating system. It is a high quality camper van. What made the purchase even more pleasurable was Jonas and his team answering all our questions and supporting us before and after the sale in the best way possible. We highly recommend Jonas, his team and Dethleffs. Thank you for your help with our purchase of the 2014 Dethleffs Globe 4 motorhome. There are 4 new motorhome retailers in Auckland and 2 more in NZ that we found in our search for our new Motorhome. They are all very competitive and have great products with different features. However we liked the German brand because of the functionality and design of colours and systems. The Dethleffs construction leaves nothing to be desired and Jonas was very helpful with an explanation of the advantages. There was a definite advantage in purchasing a new Globe 4 compared to second hand and also other brands with its up-to-date features and modern interior. Jonas spent time coaching us through the functions and did not mind after hours calls to give us advice. He had his family and staff were at the "Camper Care Mystery Creek Motorhome" show and people we spoke to were commenting on what lovely people they were to deal with and to talk to. As well as the Dethleffs wonderful products we would have no hesitation in recommending Jonas and “Zion Motorhomes Ltd”. Towards the end of 2013 my wife and I contemplated the purchase of a motorhome. After extensive research we concluded that European motorhomes were far superior in design and features.The key elements we were looking for were an island bed, an additional double berth,separate shower and toilet, a good sized fridge/freezer, workable kitchen and forward facing seating for passengers including seat belts. In addition we looked for spacious storage, at least a 3 litre engine and ALKO chassis. The Dethleffs Esprit met all our requirements at a surprisingly competitive price and included many additional features e.g. Solar panel, Sky TV etc. Subsequent to purchase Jonas worked with us in customising the motorhome to meet our personal requirements. All work was completed in a timely and professional manner. In all our dealings with Jonas he has proved to be reliable, dependable and accommodating in meeting our needs. It has been a pleasure working with him and we warmly recommend Jonas and the Dethleffs to anyone seeking a high quality motorhome. The Trend is easy to drive and control. It takes no effort at all. It does take a little patience to get used to the gear changes but one that is achieved you can cruise quite nicely over gravel or travel along motorways at ease. The Trend is very economical: over 3 and a half thousand kms it averaged an astounding 11.3 litres per 100 kms (highway approx. 8.3L/100km). The 90 litre fuel tank meant you had fewer fuel stops. When driving the vision was excellent, especially the mirrors when reversing. Having an island bed was one of the Trends greatest attributes and it certainly wasn't disappointing. The shower/toilet area is a real bonus especially when we realised it could be used as a drying room when necessary. Our 90 litre fridge/freezer was a plus and gives you greater storage though there is plenty of cupboard storage within the Trend. The skylights give the Trend plenty of light and a feeling of spaciousness. We recently purchased a Dethleffs Magic T1DBM Low Profile from Jonas of Zion MotorHomes Limited in Auckland and have been very happy with both the vehicle and the service that we have received from Jonas. We have been motor homing for the past 35 years and have owned a few motor homes, but this one is by far the best with an island queen size bed, great finishes, and lots of storage space and no rattles. The TV, stereo and GPS are outstanding and a pleasure to use. Rear garage we found handy for storing all the trout fishing rods and gear, camping chairs and outside table and barbeque. Driving is a pleasure either in town or on the open road, lots of power, and the hills are just a breeze. Thank you Jonas for all your friendly advice and assistance, we are really impressed with the way you have helped us. Hi Jonas, here is the testimonial I am happy to send re the van we purchased recently. MECHANICALLY - Quiet and tonnes of grunt! We find it restful to drive and arrive after a long day without fatigue. There are many unexpected features that make the driving experience enjoyable.. It altogether surpasses our expectations. INTERNAL LIVING - Convenience at every turn. We are constantly finding further things that add to our comfort. There is more than adequate storage, excellent lighting and the luxurious bathroom has everything to hand. The Kitchen is thoughtfully arranged and very convenient. The full queen size bed always made up and accessible from both sides is a real hit, especially to read a book or watch TV etc! ENTERTAINMENT - TV and Stereo superb and convenient. REAR GARAGE - We are able to store our folding bikes so tidy and secure, and there is still ample room to store lots more stuff. We are totally satisfied with our purchase and impressed with the Company Staff, and look forward to exploring New Zealand in our new Motor Home. We recently purchased a new Dethleffs Esprit A-Class motorhome from Jonas. We provide this testimonial in support of Jonas and his company. We spent six months searching for a motorhome and considered new, used and even importing one ourselves. We tested many models and dealt with importers, agents, individuals and retailers. We first saw the Dethleffs model at the Hamilton Motorhome Show and were impressed by its quality and finish. We followed up by contacting Jonas later after the show. After some very poor sales service in the industry it was a pleasure to meet Jonas and have some good quality service. He was willing to discuss the motorhome, show us various models and generally tried very hard to ensure our needs were met. This included meeting us on Sunday’s and also meeting and collecting us from Auckland airport. We are very impressed with Jonas. He is pleasant, honest and reliable. He goes the extra mile for you and, as an example, recently brought a part back for us, that we had damaged, in his hand luggage from Germany. We thoroughly recommend Jonas to other potential purchasers of a Motorhome knowing you will get great service, friendly help and great after sales service. I have just purchased a Magic Edition (Black) motorhome from Dethleffs. I opted for the 180bhp 3.0 litre diesel model on the Fiat Ducato chassis and have not regretted that decision at all. It has plenty of grunt and economical with it. The figures don't lie. It is a great looking machine inside and out. There is plenty of storage space and is well appointed. With the fixed island queen size bed at the rear means I do not have to set up and make the bed every day, a definite bonus! This model also has a queen size pull down bed from the roof in the middle which also can remain made. This option I have found is a space and a time saver. Jonas from Dethleffs has been a real pleasure to deal with. Nothing has been too much trouble. I wanted a different mattress for the fixed island bed and an awning fitted. Jonas had it sorted within days. No fuss, no problem. All certifications for the vehicle including cof, rego, electrical and road user requirements all part of the service, all part of the quoted price. This is a definitely plus, pick up and drive away. I had a couple of after purchase enquiries with Jonas that could have been sorted by me reading the manuals but Jonas sorted these for me over the phone. Much appreciated thanks Jonas. If I were to purchase another motorhome, it would be from Jonas at Dethleffs. 10/10. My wife and I are more than satisfied with our Dethleffs Globe 4 motorhome, and are proud to own the first Dethleffs to come into New Zealand. We have been motorhoming for 16 years, and this is our 5th motorhome, and I would dare to say our last, as we want to keep this one forever. Our most recent one was a 30 ft American motorhome and I enjoyed driving it, but felt as if I was driving a bus. By comparison the Globe 4 at 25ft (7.7m) drives like a large car. The comfortamatic 6 - speed gearbox is just wonderful, knowing exactly when to change up or down, so that the vehicle almost ‘drives itself’. Cruise-control is something I enjoy, and helps me keep from exceeding the speed limit. The 2.3 litre motor is surprisingly quite adequate going up the hills, and it is more economical to drive than my 2.4 litre Nissan car. We love the walk-around double bed, and are pleased to have a spare double bed which pulls down in the living area if friends want to stay overnight. The German engineering is the best, and Dethleffs have obviously perfected things to give a quality and finesse we haven’t found in other makes of motorhomes. We frequently relocate motorhomes from Christchurch to Auckland, and haven’t yet found one to match ours. I could go on at length describing the many brilliant features of this Motorhome; the true ‘freedom camping’ which the solar panel gives us, and the free to air TV that is always available wherever we travel. To say (as above) that we are “more than satisfied” is really an understatement, as we are totally thrilled with our purchase, and expect to live out our days exploring NZs beautiful coastline and countless other attractions.